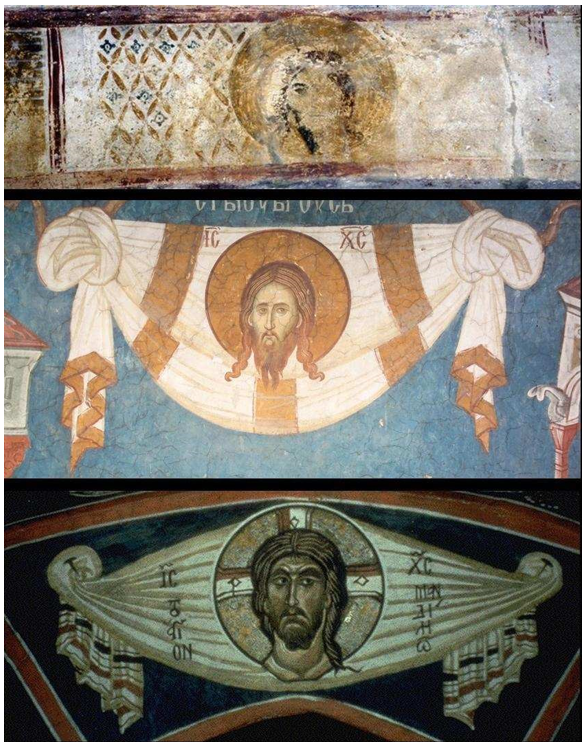 The similarity between the Shroud face and most of the depictions of Christ known in art, both Eastern and Western, is clear and cannot be attributed to pure chance; it must be the result of a dependency, mediated or immediate, of an image from the other and of all from a common source. We can identify several elements on the Shroud that are not regular, hardly attributable to the imagination of the artists, that make us understand how the ancient representations of Christ’s face depend on the venerated relic. It is reasonable to think that in the early days of the Church, the Shroud has been kept hidden for various reasons. During this period, for the representation of Christ they only used symbols or they applied to the figure of Christ appearances derived from other religions. After the victory of Christianity, sanctioned by Constantine in 313 with the Edict of Milan, a new image of the face of Jesus began to spread, which is characterized by not too long beard, mustache, narrow, tall and stately face, with long hair, falling on His shoulders, and sometimes with a middle line that divides them. Numerous testimonials, both written and iconographic, confirm that in Edessa (Şanliurfa today, in south-eastern Turkey) there was an impression left by Jesus on a cloth with His sweat and His blood. This sacred cloth, hidden for centuries and rediscovered in the sixth century, became the inspirational model for the iconography of Christ. All the legends, the traditions, the references to the existence of such an image are important for reconstructing an itinerary of the Shroud in the dark ages prior to its appearance in Europe and to understand why there are so many references to the existence of an image of Christ on a cloth. In the past years a vivid debate inflamed, among the scholars that do not accept the identification of the Edessa image with the Shroud, like the expert in Patrology Pier Angelo Gramaglia, the historian Antonio Lombatti and the historian Victor Saxer, and who, on the contrary, supports this identification, like the historian Karlheinz Dietz, the historian Daniel Scavone and the historian Gino Zaninotto. The discussion is still going on nowadays, among who, like the historian Andrea Nicolotti, thinks that the Edessa image is «a little piece of cloth, the size of a towel» and who, like Mark Guscin, expert of Byzantine manuscripts, thinks that from the sources can be drawn different conclusions: «It should be stressed that there are no artistic representations of the Image of Edessa as a full-body image or with bloodstains and the majority of texts make no reference to either characteristic; but at the same time it is undeniable that at some point in the history of the Image of Edessa, some writers were convinced, for whatever reason, that it was indeed a full-body image on a large cloth that had been folded over (possibly in such a way that only the face was visible) and that it did contain bloodstains». This is a very contentious topic, and I shall look forward to reading the paper in due course. I hope it becomes available on Barrie’s shroud.com web-site. At present I’m unaware of Emanuela’s conclusions in her paper. It seems she is addressing the question of whether the Mandylion was or was not the Shroud. I note her use of the term ‘mediated’ as the source of the various iconic depictions, to bloodstains seen on the cloth, and to the opposing schools of thought. I see that she actually attended the St Louis conference, and so she would be aware of other related papers, including those that do not equate the Shroud with the Mandylion. Time will tell, but I guess we can all expect a fairly bumpy ride over the next few months as the various papers come to light!